This delicious and easy weeknight dish can be made in 15 minutes. The creamy, tanginess of the sauce contrasts well with the meaty richness of the fish. 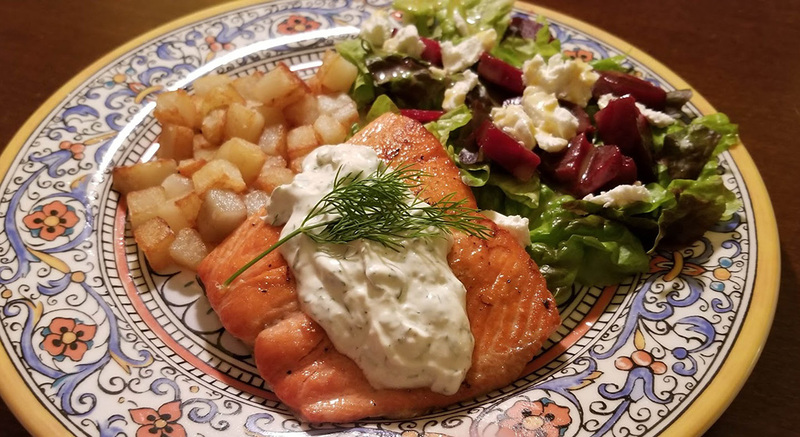 This is delicious served with a beet and goat cheese salad (recipe below) and pan-fried potatoes. 1 tbsp minced fresh dill, or 1 tsp dried. 1 tsp prepared or grated horseradish. Mix all ingredients for the sauce. Set aside. Sprinkle flesh side of salmon filets with salt, pepper, and lemon zest. Heat oil in a non-stick pan over medium high heat until shimmering. Add salmon, skin-side-up and and cook until lightly brown; 1-2 minutes. Flip salmon filets, and cook skin-side-down until desired doneness. Serve on a platter, top with sauce. Garnish with fresh dill and lemon slices, if desired. Make the vinaigrette giving it time for the flavors to develop. Next prepare the salad greens. Cut beets to desired size. Crumble goat cheese (leave goat cheese refrigerated until ready to use, it makes crumbling it much easier). Combine all ingredients except for vinaigrette. When ready to serve lightly dress salad and toss together.